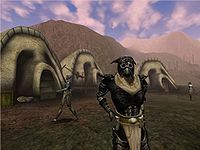 This page contains officially released preview screenshots for Morrowind. Note that these are not cut scenes or the like, but actual screenshots (and they can only look better as time goes on)...Amazing! Mind you, that these are not in chonological order, though the ones near the top are most recent than near the bottom; make note of some of the pictures having experimental HUDS. 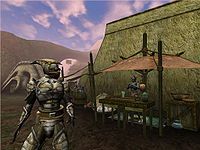 For the latest screenshots, see the Official Morrowind Site. 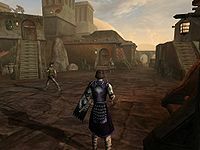 3rd person view of your character walking in Ald'ruhn. 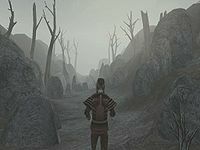 3rd person view of your character walking through a misty valley in the Ashlands. 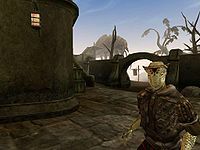 Meeting with an Argonian named Hul in Balmora. Battling a Scamp with a sword. 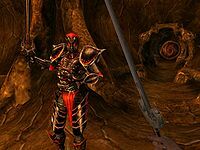 Fighting an Imperial Guard in Pelagiad. 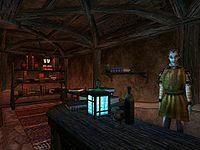 Talking with Arrille in his tradehouse in Seyda Neen. 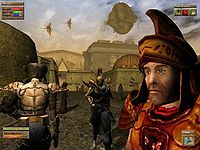 Talking closely with an Imperial Guard on the outskirts of Seyda Neen. 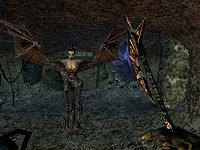 Fighting a Winged Twilight with an Axe. 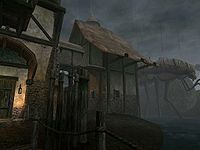 View of Seyda Neen during a light rain shower with a Silt Strider in the distance. 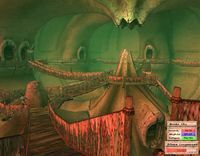 An editor view showing a dungeon layout. 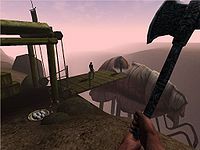 1st person view of the character walking through the Bitter Coast Region with a large axe. 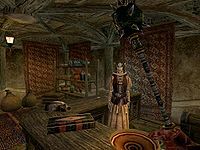 1st person view showing you holding a large mace in Dralasa Nithryon's shop in the town of Balmora. 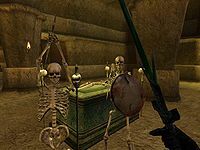 Fighting two skeletons in what appears to be a crypt. 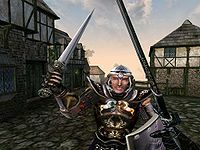 3rd person view of you fighting an Orc in a Dunmer Stronghold corridor. 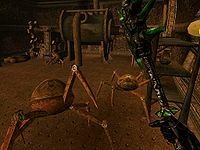 Battling some Spider Centurions with a Glass Axe. 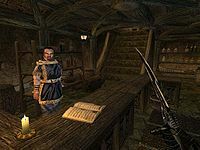 Chatting with Clagius Clanler in his shop in Balmora while holding a Daedric Dagger. 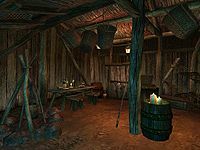 Closeup view of the first floor of the Halfway Tavern. A small lane arching with roots at night. 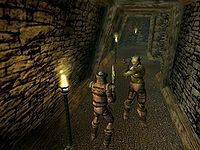 Battling a Dark Elf in Gnisis. 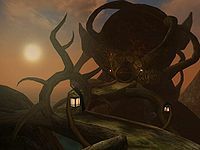 View of Ald'ruhn from above. Shot of a little shanty showing the typical detail in the game. 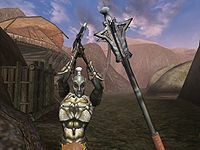 3rd person view of your character standing in Balmora. 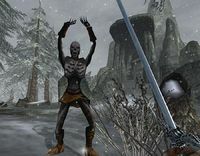 1st person view of your character battling a well equipped Dremora. 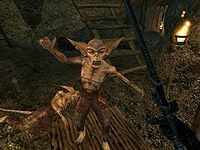 1st person view of your character fighting an Ogrim. 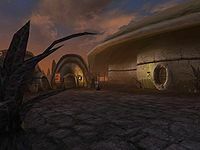 Shot of the Telvanni Council House at sunset. 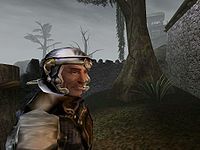 A traveler and Guar get caught in an ash storm. Make note of the experimental HUD. 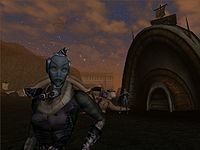 A peaceful gondola ride through the canals of Vivec. Make note of the experimental HUD. 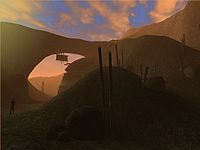 A beautiful sunset at the entrance of Gnisis. 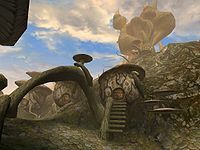 Shows the wonderful graphics available to the Morrowind engine. 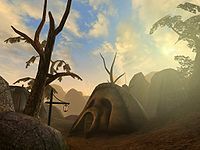 Another typical view in Ald'ruhn at dusk or sunrise. Interior view of a shop of some kind with many books. 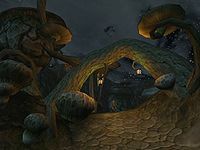 A Telvanni home. Strangely these are grown rather than built. 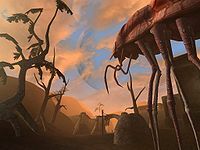 Great view of a Silt Strider walking in front of Tamriel's two moons at sunset. 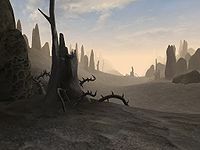 Spooky view of the Vvardenfell wilderness with a little fog/ash/dust. 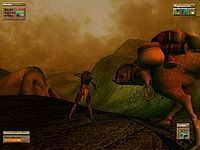 Another 3rd person view of your character approaching a charging Kagouti. 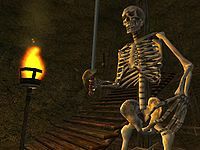 Another view of an undead Skeleton. 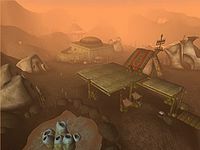 A great shot of a house in Sadrith Mora with a thin haze during the day. 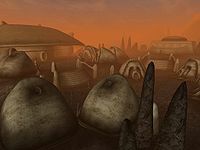 Another general view of a town during the day showing the glow from the sun. 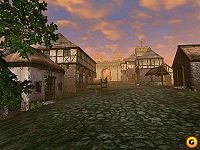 A market square in the city of Vivec showing the amount of character detail during early development. Make note of the experimental HUD. 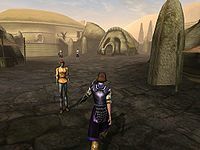 Conversing with a merchant in the market of the town of Gnisis. Shows the start of the user interface. Make note of the experimental HUD. 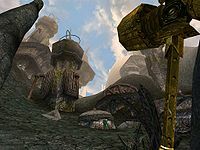 The market of Gnisis outside of the temple. 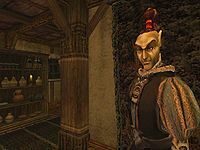 Again shows the wonderful amount of NPC character detail. 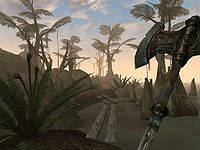 You approaching the strider port in Gnisis with a hefty axe in hand. 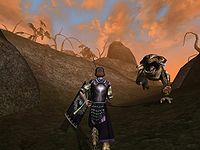 Silt Striders can be used to travel faster around Vvardenfell. 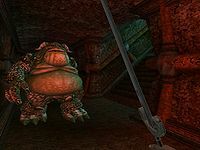 Image of the left side of Gnisis and well armored NPC possibly cut from the game in development. 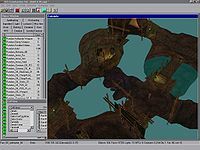 Another view of the construction set editor showing the powerful script window. 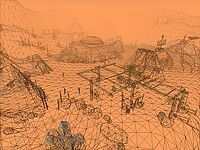 Wireframe view of the town of Gnisis. 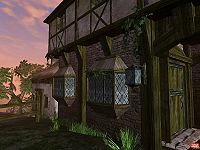 An excellent view in Pelagiad as you stroll down the road towards the city gate. 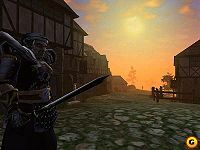 You and a sullen guard observe the sunset (or sunrise) in Pelagiad. 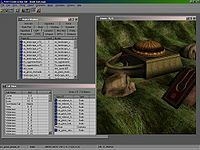 Another view of the TES Construction set, this time editing a cave dwelling of some sort. 1st person view, holding a dwarven warhammmer while looking up at dwarven ruins. 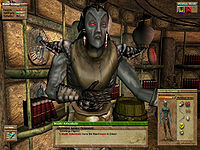 Talking with a female dark elf outside of a trade house. Again, note the wonderful character detail. 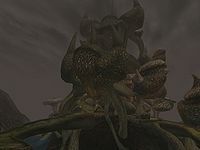 In the far background in the sky, note the floating creature known as a netch, killed for making armor and other goods. 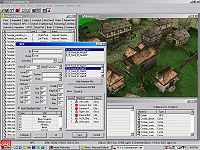 Screenshot of the construction set editor, which comes with the game and allows almost complete control over everything in the game. 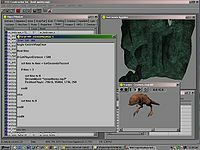 This is the same editor that Bethesda used to make the game. Aerial view of the town of Gnisis. Although this is a small town, there is a great amount of detail. 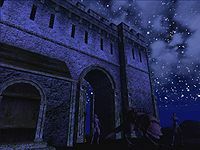 Night time outside an Imperial Fort near the town of Gnisis. 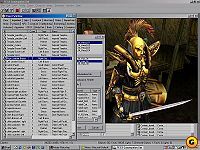 Another great view of the TES Construction set this time editing an Ordinator. 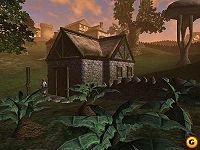 Apparently you are trespassing in someone's garden outside of Pelagiad. 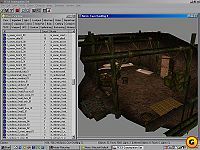 The TES Construction set editing someone named Conan in a Nordic village. 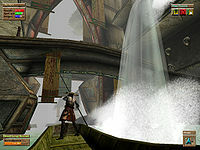 Early version of the game showing a character named Bendu Olo exploring Under-Skar. This page was last modified on 30 September 2018, at 13:12.